This Wednesday I'm linking up with Erika and Shay for their Stranded series. If you've been following along I've talked about what shoes I would bring and what books I would bring if I were stranded on an island. This month? Movies! Gosh this was hard. I love movies and picking just three and knowing that these were the only three and I would be watching them over and over and over...tough choices my friends. The 1995 BBC version only, please. 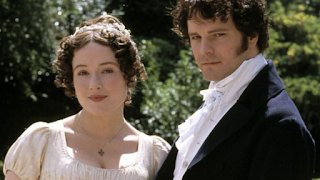 Yes, I admit I am a snob about my P&P adaptations. In my opinion, this one is perfection and has held up even 20 years later. So good. Jennifer Ehle as Lizzie Bennet is the best decision ever and don't even get me started on Colin Firth as Mr. Darcy. This movie has been in my permanent rotation since college when I taped it (yes, on a VCR) in my college dorm room freshman year. I wore that tape out y'all. My college housemates called it my drunk movie. Not that there was any drinking involved, but I'm not one for large crowds or lots of people I don't know, so I tended to abstain from a lot of the college parties or I was on duty (raise your hand if you were an RA!). My default on those nights when my housemates were out and I was home, I'd watch this. Please, please, please tell me you all have seen Clue? "Flames, on the side of my face..."
If Pride and Prejudice had the perfect cast, then the casting of Clue was INSPIRED. Tim Curry as the butler, Wadsworth? And Madeline Kahn alone as Mrs. White is worth watching the movie for. Funny, campy, eminently quotable, you will not be disappointed with this movie. Iron Man, Thor, and Captain America in one place? Sign me up. And don't forget that badass Black Widow. 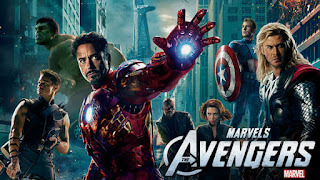 I am all in for superhero movies and I never tire of The Avengers. Or any of those Marvel movies: Captain America: Winter Soldier, Avengers II, Iron Man. All of them could easily make this list. I love the interplay of all the characters in this one, especially with all the screen time Loki gets. Those are my picks...what would you go for? Share in the comments! Clue...a good one to put on my list! ;) I love reading other's link ups. 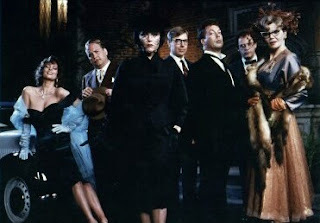 I could watch Clue over and over again!